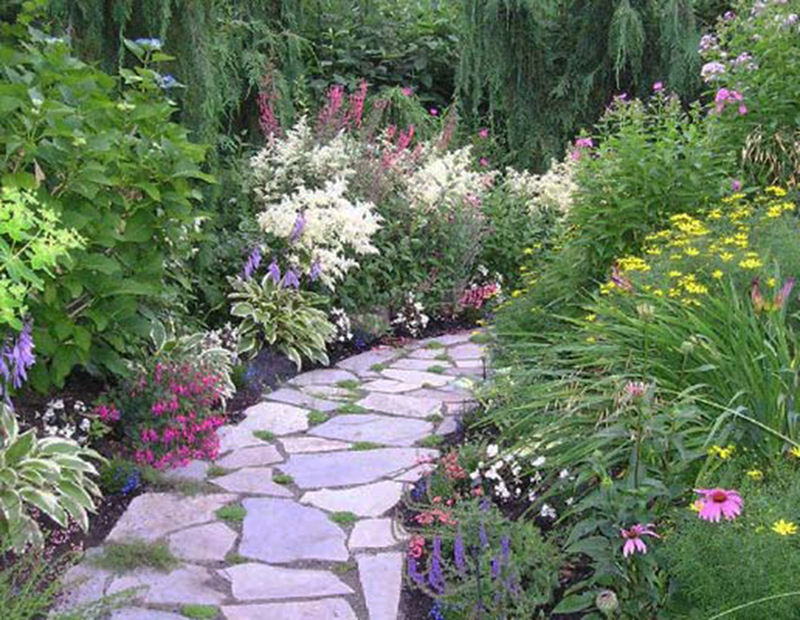 Linda’s Lane provides a beautiful transition of perennials as you walk along the pathway. The lane is part of the ‘Eagles Nest’ garden. 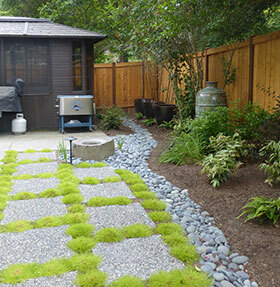 The garden won Seattle Homes & Garden Magazine’s 2006 ‘Home of the Year’ award. 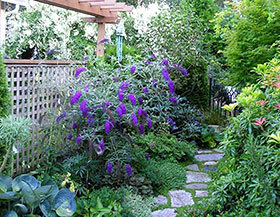 A small walkway at Linda’s previous garden, ‘Morning Song’, again shows that natural feel of her colorful plantings. I started my career in landscaping in the mid 1980’s. While working part time at a nursery, I got the plant fever and wanted to learn more. I enrolled in school at Edmonds Community College. I got my certificate in ornamental horticulture with a degree in landscape design. 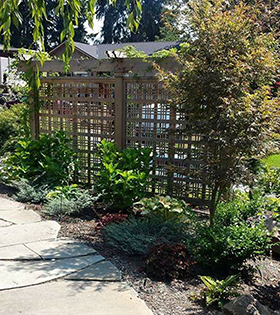 I continued in the nursery business and responded to requests from customers who needed advice on their landscapes. 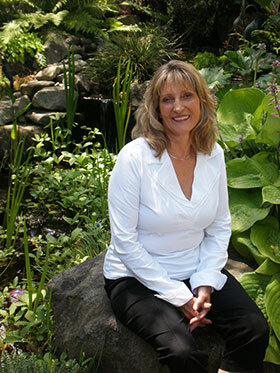 As things evolved, I started Landscapes by Linda and started out doing some design and gardening. It didn’t take long before I was hiring people and installing those designs. I love renovation and working with residential clients. 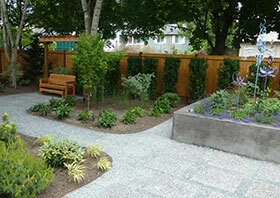 My biggest reward is to inspire those clients to become passionate about their gardens. 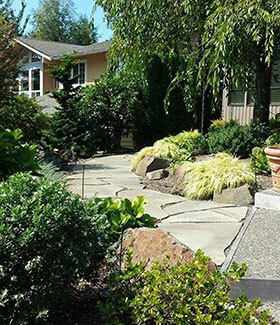 In 1995, I changed the company name to LBL Landscape Group and started doing more than just plantings. We specialized in water features, walls, patios and pathways. My landscapes tend to have a natural feel with the sound of water, rock outcroppings, fragrant plants with lots of textures and colors. My favorite plants are broadleaf evergreens with borders of perennials. In 2006, I downsized my company in an effort to spend more time with family, and enjoying the outdoors through hiking, skiing and kayaking. 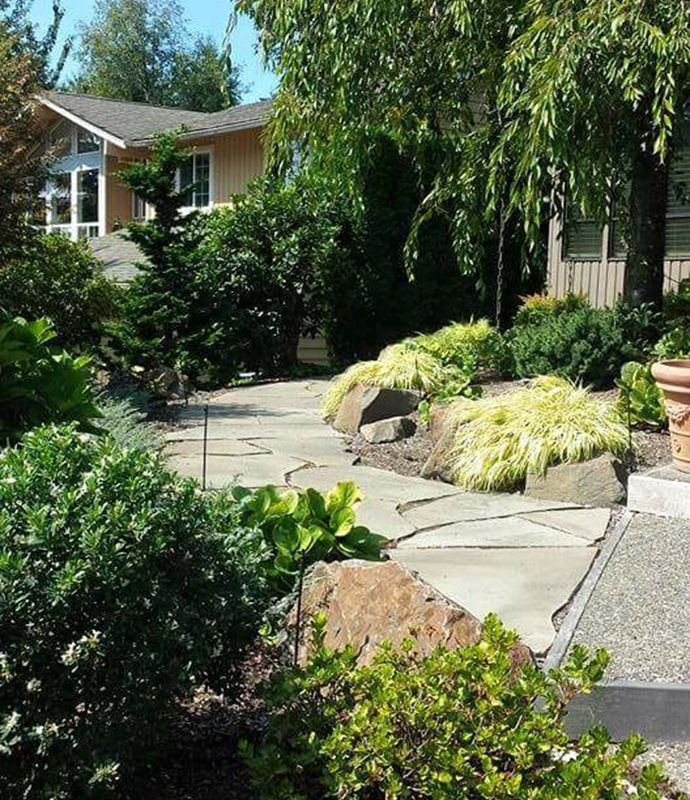 My corporation is still LBL Landscape Group, but I market Landscapes by Linda which speaks more about who I am and the passion I have for creating gardens for homeowners. I focus on doing consultations and design and will still manage projects that I have designed. At the 2015 Northwest Flower and Garden Show, APLD offered consultations to people attending the show. I consulted with a couple who had a previously drawn design that they wanted to make changes to and they had pictures to show me their project. After the show was over, they paid to have another consultation with me at their home. I reworked the design and they hired me to install the project. 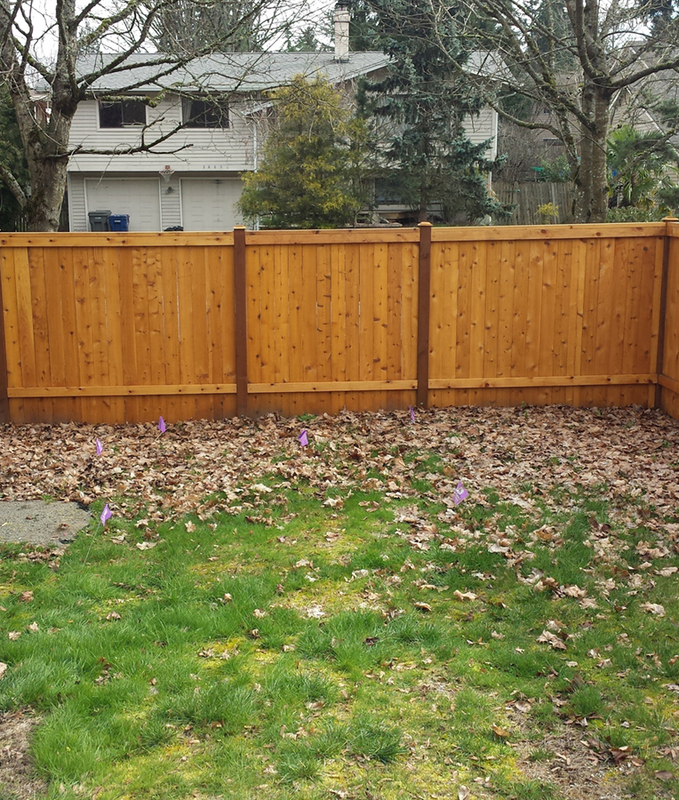 The biggest challenge on this project was all the existing Maple trees that the city wouldn’t let them remove. So we had to accommodate the roots and shade from these trees. 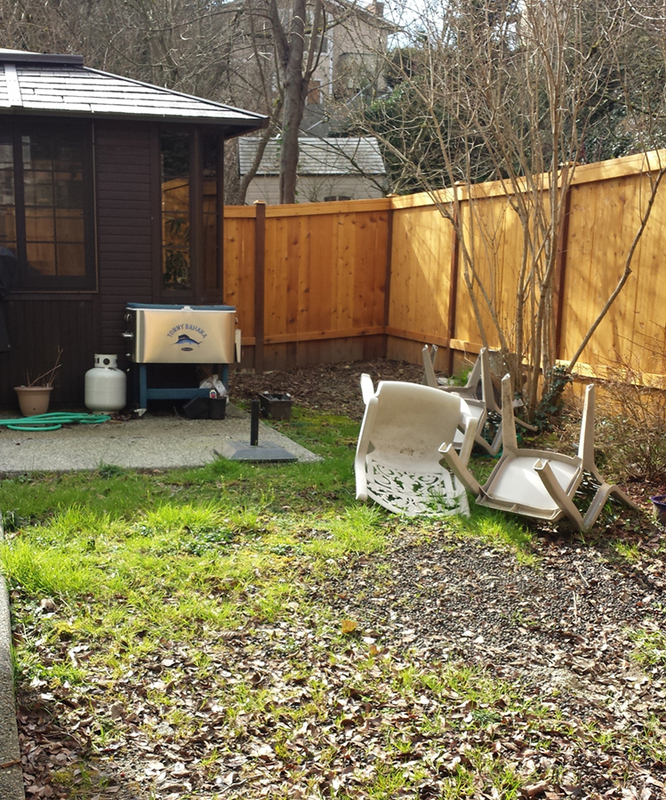 A small section of the backyard had enough sun to grow herbs and vegetables. 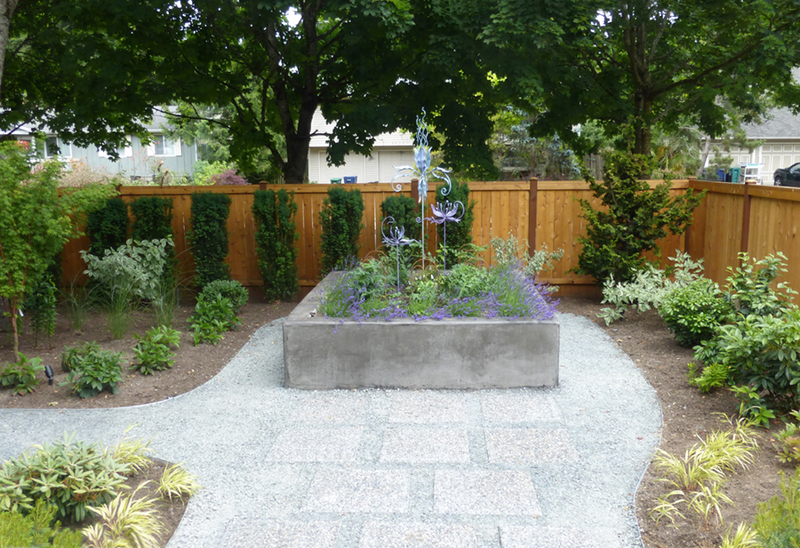 We poured a concrete planter for them to garden in and the planter was visually a continuation of the existing concrete planters that were part of the existing upper patio. Her husband wanted a secluded sitting area in the garden. 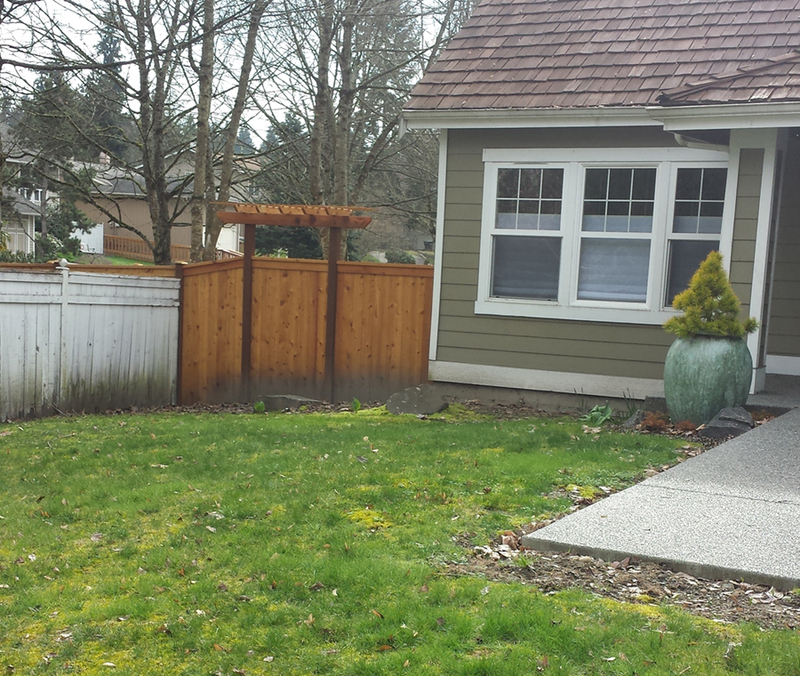 We built an arbor above the seating area that matches the arbor above the gate coming into the backyard. A cedar gliding bench finished the seating area. In one of the beds across from the seating area is a bubbling decorative pot for a little water sound as well. We also created new planting beds in the front yard again raising the grades where possible and planting Prunus laurocerasis (Portugal laurel) for added privacy. The lawn was renovated and a more interesting planting by the front door includes Sarcococca ruscifolia, Astilbe, Helleborus Pink Frost and Heuchera Berry Smoothie. 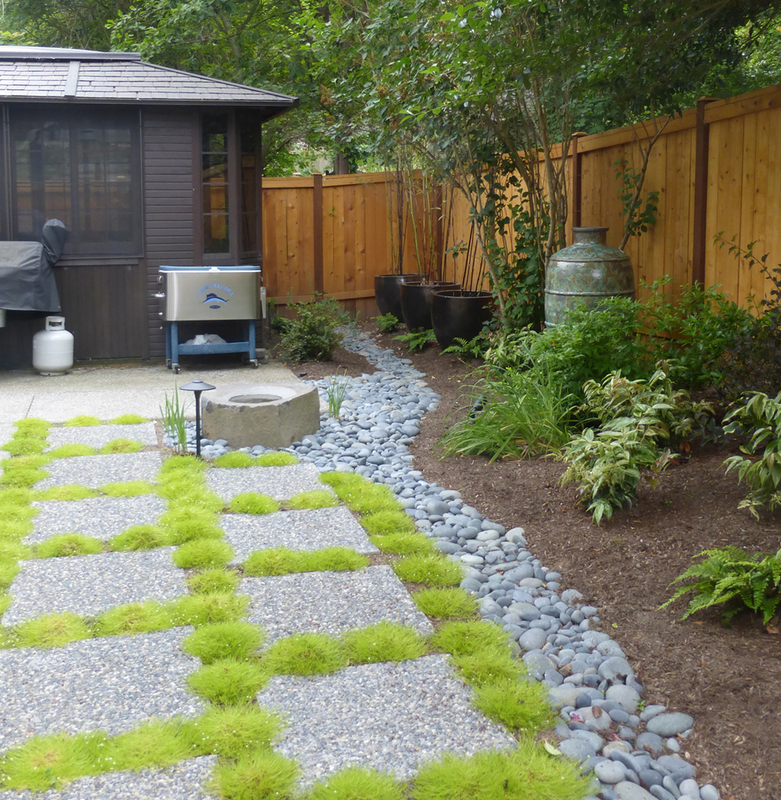 A side yard that didn’t drain well was enhanced with a dry stream bed and concrete stepping stones with moss. The couple went on a planned trip that took them out of the country for the majority of the project and trusted us to work on their project while they were gone. 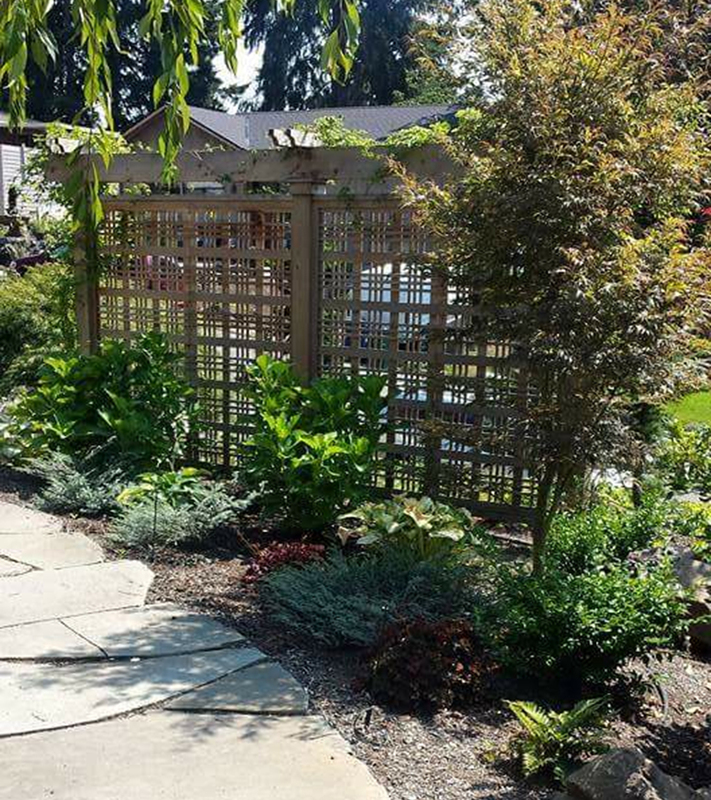 The open patterned screen allows light to filter into the walkway. 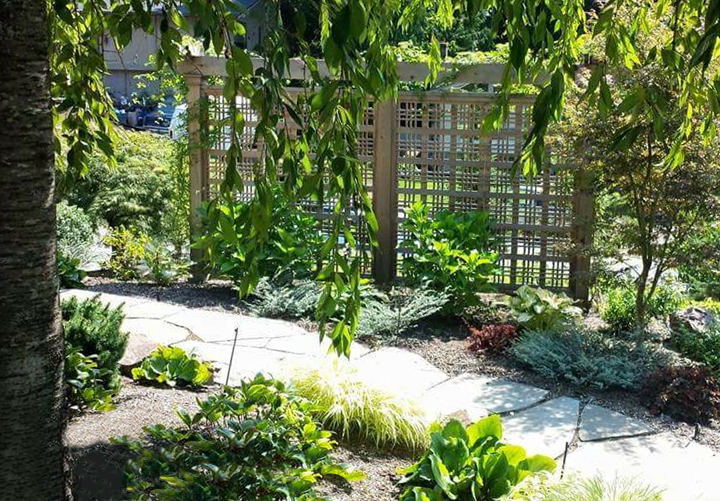 Hydrangeas, Hostas, Heucheras and Hebes soften the landscape while adding seasonal interest. 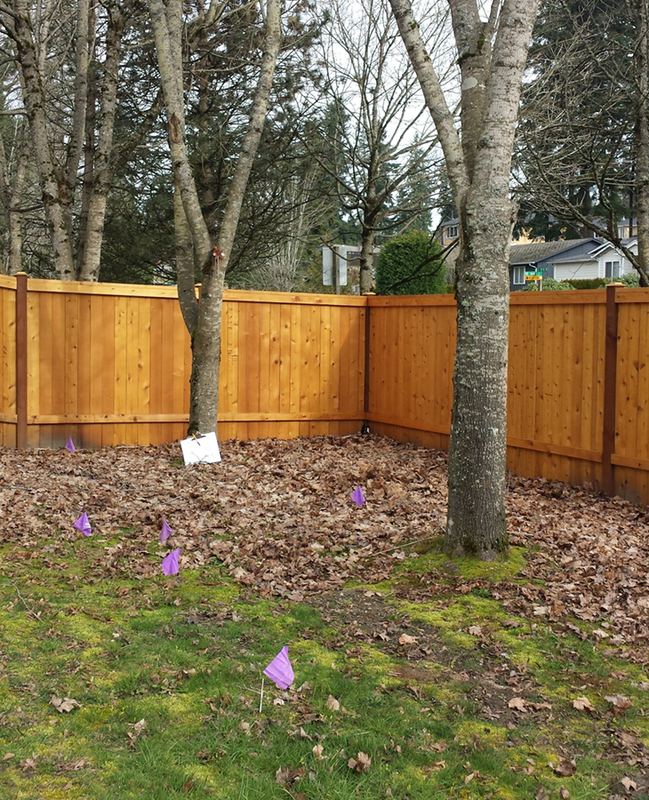 The new under-planting of the exist tree improves existing soil and health to tree while visually unifying the area. 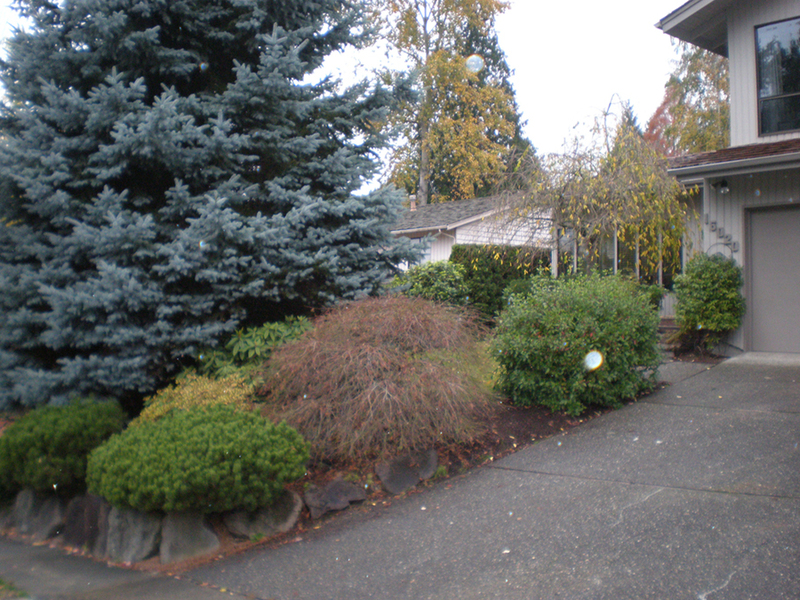 A retired couple from Redmond was referred to me in 2008 to re-design an old overgrown landscape. After completing the design, the quote given to them was more than what was in their budget at the time. They chose to do most of the removal themselves. They called me back in 2013 to make some changes to the design and I had the opportunity to re-bid the project with another crew and we got the job. There was an existing rockery that we replanted with Abies balsamea ‘Nana’ (Dwarf Balsam Fir) and Cotoneaster microphyllus ‘Cooperii’ (Cooperi Little-leaf Cotoneaster). The upper area on the street side is planted with Epimedium x rubrum (Hybrid Epimedium) and Narcissus varieties (Daffodils) with the Existing Laceleaf Maple. Mountain. 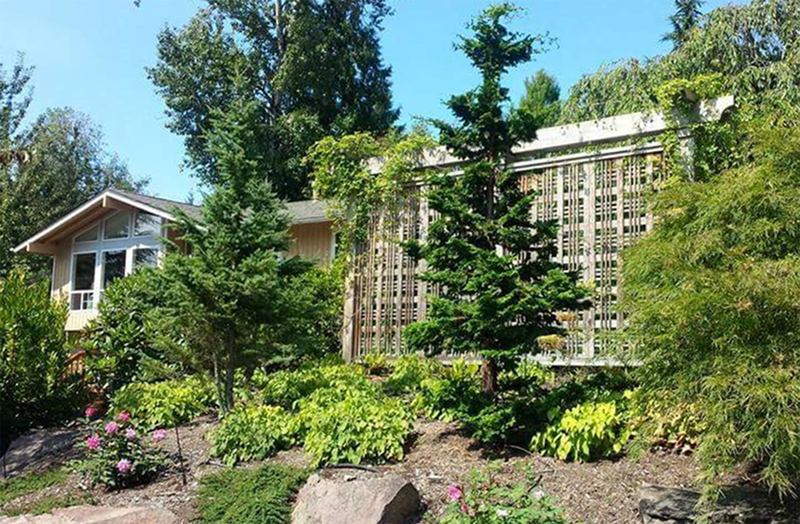 Hemlocks were added to help screen the neighborhood and improve the sense of privacy while creating an inviting front yard. The existing flowering Cherry in the front of the house was enhanced with additional shrubs and perennials to complete the planting. 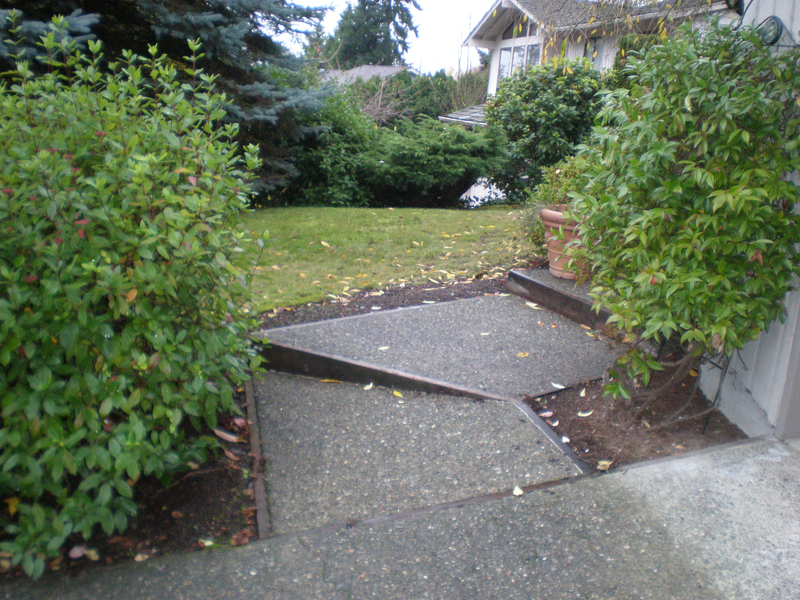 We re-graded the upper front yard to provide a level area for the bluestone walkway and rock outcroppings. 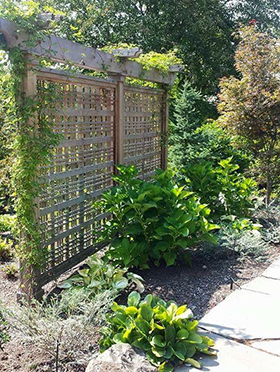 My son, who likes to do wood-working built the wood screen for privacy from the street. 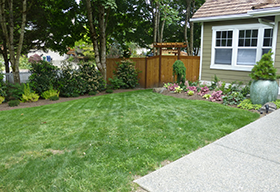 It was a front yard project but since then I’ve consulted with the homeowner on the back and he has continued to do the work one section at a time. 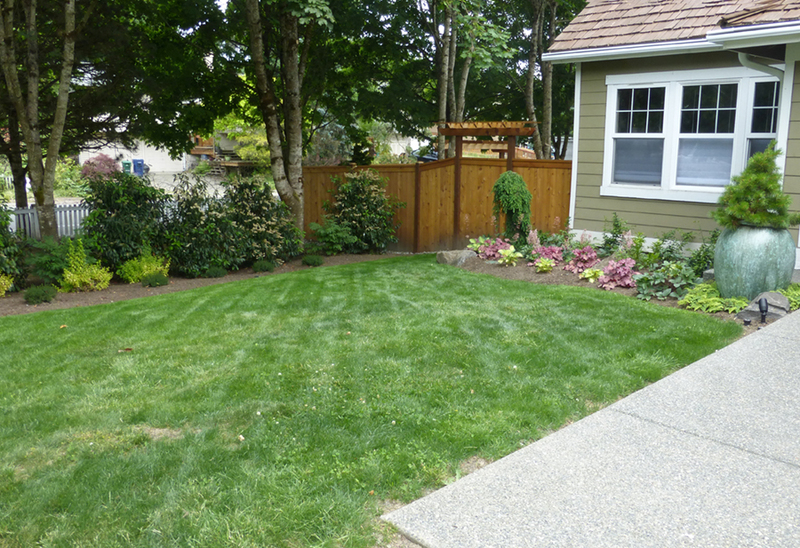 Landscapes by Linda continues to stay involved with the garden, during the summer. 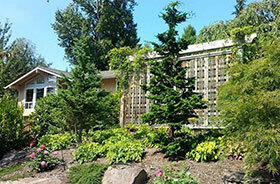 The irrigation system is monitored and garden maintenance is done to keep the integrity of the landscape. It’s a rare opportunity to stay involved in the landscape as it matures. Akebia vine is supported by the wood screen.